Mogao Grottoes is located in the western end of the Hexi Corridor along the ancient Silk Road in Dunhuang, China. From 366 to 1368 AD, a large group of Buddha caves were constructed that consists of 735 caves, 45,000 m2 mural paintings, and 2,415 argillaceous painted sculptures. It was listed as a World Heritage Site in 1987. Until now, most mural paintings at Mogao Grottoes have been dated by directly referring to the mural texts or historical documents. However, the ages of some are undetermined due to the lack of reference materials or the disagreement of art experts in paintings. The drawing style of mural paintings changed throughout history, and the drawing style can be determined and quantified through painting data. By formulating the problem of mural dating into a problem of drawing-style classification, a new dating method is developed by encoding the drawing styles with visual codes learned through deep learning. 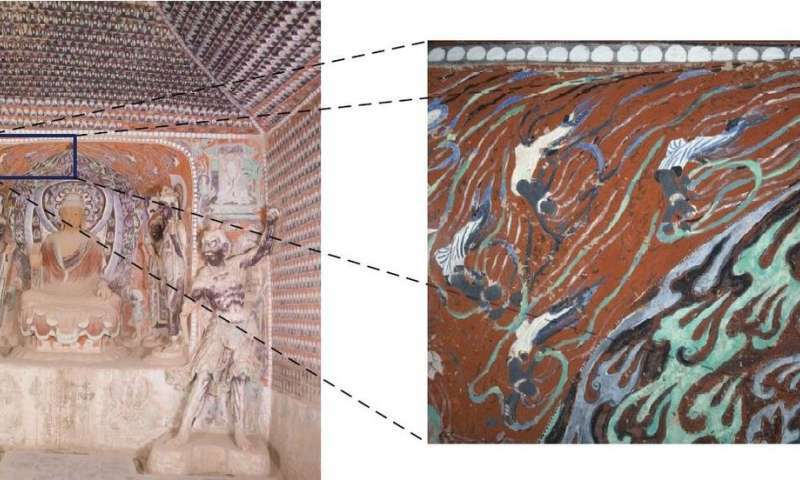 This new method successfully determined the creation era of six mural paintings at Mogao Grottoes. This new research work is led by Qingquan Li from Shenzhen University, just accepted by Science China Information Sciences, under the title "Dating ancient paintings from Mogao Grottoes using deeply learnt visual codes." With the help of experts from Dunhuang Research Academia, seven mural paintings from two grottos (No. 205 and No. 206) were chosen as the research objects for this research. For grotto No. 205, two main drawing styles were declared by Dunhuang artists, which were the Peak Tang and the Middle Tang. Experts guess that the grotto No. 205 was originally constructed in the Early Tang or Peak Tang, but the construction was handicapped by wars of the Anshi Rebellion for about 50 years, and then the construction was succeeded in the Middle Tang. However, until now, there was no scientific or quantitative study to support these declarations. For grotto No. 206, painting styles are controversial between the Sui's and Early Tang's (see Figure 1). Specifically, for the two Guanyin paintings on the west wall of grotto No. 205, Mr. Wen-Jie Duan, a highly respected former President of DunHuang Research Academia, dated them into Peak Tang, while Mr. Hui-Min Wang, a distinguished expert in Archaeology Institute of Dunhuang Research Academia, dated it into Early Tang. To reveal the creation era of these paintings, Qin Zou, a researcher from Wuhan University, collected 3860 mural paintings from 194 different grottoes with determined creation-era labels, and used data augmenting to form a training set of over 50,000 images. To find the era-discriminative visual codes in these paintings, the authors constructed a deep convolution neural network and classified these painting images into the right eras. Based on the classification model, a dating method was built and applied to date the seven paintings. Six of the new dating results were approved by experts from Dunhuang Research Academy. "These dating results are correct and the method is great," Mr. Hui-Min Wang said. However, the deep learning method dated the painting "Peacock King" in grotto No. 205 into Middle Tang Dynasty, while Hui-Min Wang dated it into Wudai Dynasty, which brings up a new research topic to the community. "To the best of our knowledge," wrote the five researchers, "this work represents the first account of a scientific and quantitative manner to support the era prediction and reduce the uncertainties in dating ancient paintings by using deep learning."